Books A Million | Yobot Inc. I have a book addiction. It all started when I was a child, reading was a comfort and my favorite activity, and then in high school, I worked at Waldenbooks in the White Oaks Mall, which was my dream job. That job enabled me to support my addiction – to buy books, and I haven’t stopped since! 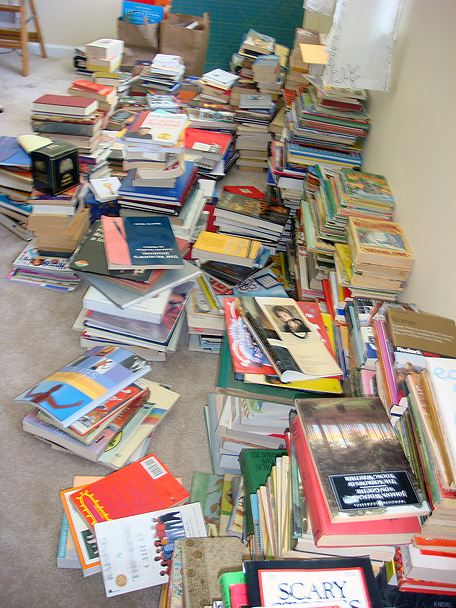 This picture was taken a few weeks ago when I reorganized my bookshelves in our “library / guest room” upstairs. Yes, it’s a lot of books, I know. The books just multiply up there, left on their own. Open Books. They will take most any books for donation, and then they sell them to support literacy programs. They are always looking for donations and volunteers, check it out! My new, favorite summertime pastime is going to used book sales, and rescuing poor, lonely books to add to my ever-growing addiction – I mean collection. This upcoming weekend is my favorite used book sale in Chicago – the Newberry Library Book Fair. If you live in Chicago and have a chance to go, it’s an amazing, weekend-long event where the books are all cheap, and there’s over a 100,000 to choose from! Even the squirrels are into it. It’s a book-addicts dream – I can’t wait. I also read lots of books. I love to read!!! We don’t have a Library though. We just borrow them from other library’s. Thanks so much for mentioning us on your blog — we’re thrilled to have your support and hope you’ll find a myriad of options for staying involved with Open Books. Can I just make an observation here dear Pamela. Here’s this perfectly nice story about your love of books (aka addiction to) and reading and such… minding it’s own little business right up until the mention of squirrels. So perhaps my faculties are not as sharp as they used to be but might I ask what any of that had to do with squirrels? Maybe you just wanted to test me to see if I’m paying attention as you know how I feel about the obnoxious rodents. Or maybe ‘squirrels’ is code for something very taudry and outrageous. OR…maybe you’ve just lost your marbles and your love of all (or maybe most) things with big furry tails has gone too far. One might want to reconsider which addiction needs more immediate attention. I’m just sayin. hahhahhaha Shalyn Mary you crack me up. Really, there is a reason for my squirrel comment. At the Newberry Library book fair, they have areas around where you can “squirrel” away your books before you check out – they are called squirreling areas. Really! Just another reason to love the book fair!